In 1978 I entered an Evangelical seminary in the New England area. I chose to go there over other options because its New Testament department was reputed to be one of the best in the area, and in addition the school had a vibrant urban ministry program. Though I probably had heard the term “Evangelical” before, I had no real idea what it meant, nor did I care. However, upon entering the school, all my professors and most of my fellow students used the term “Evangelical” as if was synonymous with “Christian.” I was mystified how I could have been a Christian for nearly 10 years at that point, and yet had no idea what an Evangelical was. So I asked. Dr. David Scholer, now deceased, was a New Testament professor for whom I worked two of my three years at the seminary. One day I asked Dr. Scholer: “Can you tell me what an Evangelical is?” His reply was priceless: “An Evangelical is a person who another so-called Evangelical considers to be one.” In other words, Evangelicals are a theological club that is overwhelmingly white, middle class and located in suburban and rural areas. This explained why I as a person involved in urban youth work, as well as my African American classmates, didn’t qualify as Evangelicals. We had not been inducted into the club until by inadvertently going to that seminary we became one. Historically, Evangelicals trace their roots to the Fundamentalist-Modernist controversy of the 1920’s. Conservative theologian Carl F. Henry and evangelist Billy Graham, along with several others wanted to maintain the conservative theological orientation of the Fundamentalists, while being more engaged with current social and political issues like the Social Gospel folks. So they created a middle path, recruited other like-minded pastors, started some colleges and seminaries and Evangelicalism came into being. They founded a magazine Christianity Today, which came to be and still is the voice of Evangelicalism. However, over the decades from that year, with the likes of so-called Evangelical leaders like Jerry Falwell and Pat Robertson began linking Evangelicalism with a conservative political agenda: pro-family, pro-life, pro-gun, pro-business, anti-government regulation. While I was still at seminary I saw this ascendancy of conservative politics over theology when actor-turned-politician Ronald Reagan was elected easily over lifetime Bible-teaching Evangelical President Jimmy Carter, largely with the support of the Evangelical vote. 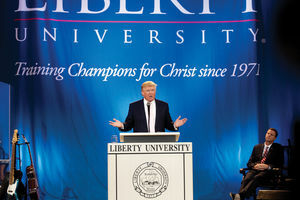 Fast forward to 2016 and now Donald Trump, thrice-married, wheeling-dealing, foul-mouthed real estate mogul who routinely berates his opponents and detractors, has been endorsed by Jerry Falwell, Jr., the president of Liberty University, and Robert Jeffress the pastor of First Baptist Church, Dallas has said he would be “very comfortable with Trump in the White House.” All of a sudden Trump talks about “we Christians” and makes all the promises conservative Evangelicals want to hear. All these years later my professor’s definition of Evangelical applies here; Trump is an Evangelical because he got invited into the club. I have long since shed any personal identification with Evangelicals. For a while I allied myself with so-called progressive Evangelicals like Ron Sider, Tony Campolo and Jim Wallis, all religious leaders I respect. I teach at a college whose president likes to link to Evangelicalism, though many if not most of the faculty do not identify as such. I even hold to some “evangelical positions” such as a concern for the family and a commitment to pro-life concerns. (However, I don’t feel outlawing abortion is the answer, but rather providing affordable safe alternatives. Also I am what Ron Sider calls “completely pro-life” linking my opposition to abortion to other life issues such as opposing capital punishment, refusing to participate in war, and gun violence prevention.) Long ago I found that Evangelical was not a club I want to be a part of. To be fair, there are a number of Evangelical leaders, like Richard Land, president of Southern Baptist Seminary, who have warned against a Trump-Evangelical alliance as fundamentally adverse to their conservative Christian values. Yet even many of them have come out in support of Ted Cruz, who speaks the Evangelical language, but who is reportedly known around Washington and within Republican circles as egotistical and who is generally considered to be a distant and unlikeable person. The natural Republican candidates for Evangelicals would be people like Gov. Mike Huckabee or Dr. Ben Carson, but since they are not leading candidates, my guess is that Evangelicals would rather back a winner than be faithful to their creeds and values. As a follower of Jesus I find this Trump-Evangelical romance to be deeply disturbing. As I seek to understand the life of Jesus and follow his teachings, I practice a faith that is centered on justice for the poor, a call to repentance for the rich and powerful, and the building of a beloved community across lines of race, class, gender, sexual orientation and national identities. Furthermore, I don’t see hope as ultimately promised to any political party or candidate, but rather in the Spirit of God working through people of faith to seek after what Jesus called the Reign of God. I participate in the electoral process and work to influence policy-makers, but do so out of a deep commitment to values and principles of Jesus. By contrast the Trump-Evangelical alliance has faint echoes of Adolph Hitler’s co-optation of the German Lutheran Church in the 1930’s. One can only hope that enough Evangelical leaders will wake up to the reality an alliance with Donald Trump or Ted Cruz is an alliance that calls them to forsake the basic values they espouse, and that such an alliance hurts not only their cause, but the country as a whole. Evangelists seem to have an anti-Christ orientation. They seem to be self-righteous and hateful, embracing racial and religious bigotry and economic inequality although many evangelist are themselves poor. life and teachings of Jesus Christ.